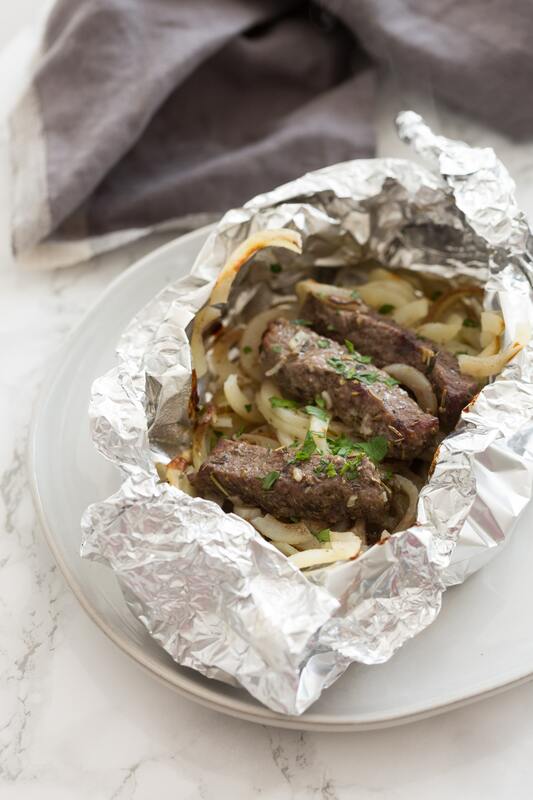 Cook your steak and potatoes in foil in the oven for an easy weeknight dinner with an even easier cleanup! The potatoes are spiralized for added fun! Typically, a “steak and potatoes” type of person is someone who doesn’t like veggies. The only veggies they have are potatoes. 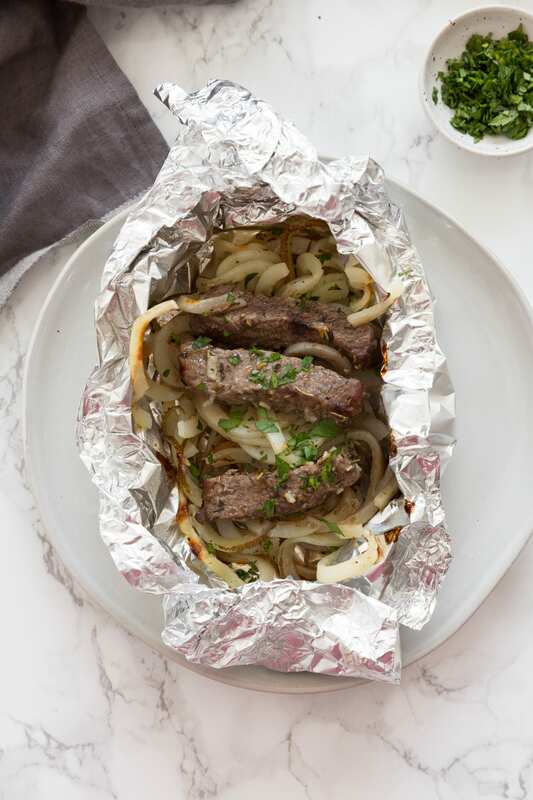 Well, “steak and potatoes” types can rejoice, because we’re stepping up your game with these spiralized potatoes, cooked in steak juices in a foil packet in the oven! Now, I totally suggest serving these steak and potatoes with another side veggie, like some brussels sprouts, broccoli, or even just a side salad. But, if you’re trying to get your meat-and-potatoes-loving spouse or friend to accept spiralizing, this is a great gateway! And you can also use parchment paper if you don’t like using foil! Now – who’s a steak and potatoes kinda person that’s excited to try this? In a large bowl, place the steak, potatoes, oil, garlic, dried herbs, season with salt and pepper and toss to combine well, and leave in the refrigerator for 30 minutes. 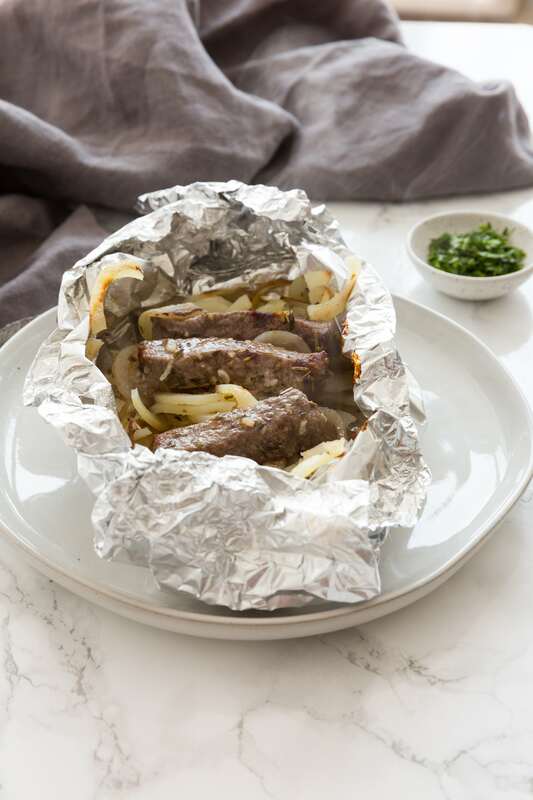 Divide the steak mixture between 2 sheets of foil (about 12 x 12), then wrap the foil tightly around the mixture to form packets. Place in the oven and bake for 15-25 minutes or until cooked through to your desired doneness. Hi! I’m curious how the texture of the steak came out? Since it was steamed was it tough or chewy? Would this be safe to feed a toddler?